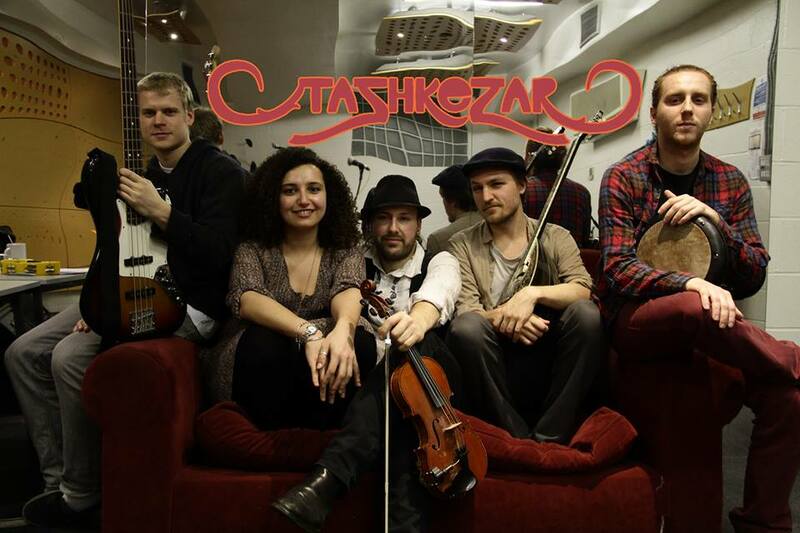 TASHKEZAR: Tashkezar present a groovy and refreshing retelling of classics, lesser known gems and original music from the Arabian Middle-East, from Turkey and Greece and from the Balkans. They are a 7-piece super-band with members from Egypt, Uzbekistan, France and the UK. Their transcultural vibes and explosive fusion sound takes in powerful Mediterranean rhythms, mesmerising Arabic vocals and melodies, punchy Balkan horns and floor-shaking bass lines. Be ready to dance. Opa! Led by Mariam Ali, an Egyptian-Montenegrin singer songwriter, Tashkezar takes their audience on a mellifluous ride with their line-up of lead female and male vocals, violin, Greek bouzouki, trombone, electric bass with darbuka and cajon percussion. Their debut EP “Tannura” has been aired on BBC 6 Music and their previous gigs include Boomtown Fair, Henley Festival, Purbeck Valley Folk Festival, Cairo Jazz Club and Hootannany Brixton.